At the end of the day, Zeroes was an ok read – with really great, fun parts but underwhelming on the whole. Given the premise and the authors involved, I am afraid I was expecting a lot more. Zeroes is the first in a new YA superhero trilogy written by heavy-hitters Scott Westerfeld, Margo Lanagan and Deborah Biancotti. In it, six teenagers, all born in the same year of 2000, have superpowers. They are the “zeroes”, brought together by their Glorious Leader Nate (or “Bellwether”), an ambitious young man who has a vision for the group and had been trying to train and develop their abilities. Then, one year before the story starts, Ethan/”Scam” torn them apart with the truths no one dared to say out loud. Now Scam is in trouble: the “voice” that speaks on his behalf once more speaks truths but this time, to the wrong people. With both criminals and the police after him, he has no one to turn to but the zeroes. And they come to the rescue. Like a well-oiled machine they get him out and to safety but when doing so, start a chain events that could prove fatal. And then they find another unknown zero out there. 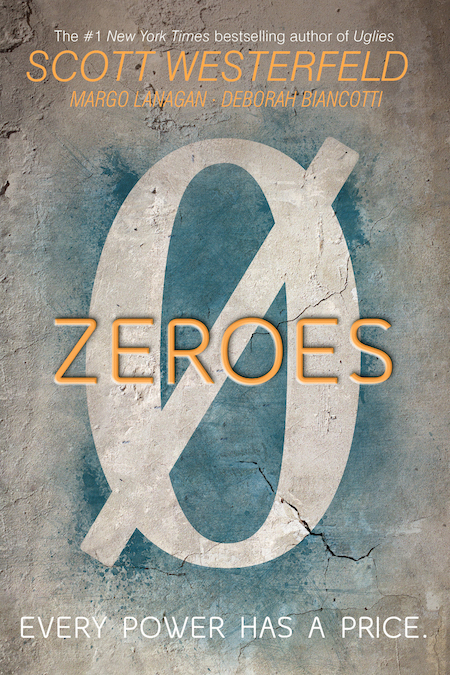 Zeroes is a character piece: the characters’ motivations and inner conflict move the story along and the chapters alternate, with viewpoints from all six characters. I understand that each author is responsible for two out of six (but no one knows who writes who). An aside: it’s difficult to differentiate each of the characters’ voices and I’d be hard press to even start guessing who wrote what. I wonder: does this mean the book is seamlessly edited? Or that it is far too edited to make each individual voice sound pretty much the same? Digression aside, Zeroes deals with superpowers that are less flashy and cool and more… subtle, double-edged, inconvenient and often downright awful. Take for example Anonymous: who can disappear so easily that everybody has problems remembering him – even his own family. Mob, who can control the feeling and moods of a crowd but also be overwhelmed by them and when negative feelings are enhanced, things can definitely turn to worse. Crash, who can literally crash all electronics but who finds it hard to control her power and could potentially destroy entire communication nets – not to mention the ill-feeling she has whenever near that “noise”. Or Flicker who is blind but can see through everybody’s eyes (apart from Anonymous’ for some reason): if you think this is a disgusting invasion of privacy: YOU ARE CORRECT. Most powers here – especially Flicker’s, Mob’s, Scam and Bellwether’s are about controlling/affecting other people – their feelings, their mood, their eyes and their reactions. The moral and ethics of this is a recurring element for some of them but mostly, these teenagers – especially Nate – are incredibly self-centred and lacking empathy. I kid, of course. The point of the novel – and I am guessing of the entire trilogy – is that journey of moving away from being stupid idiots to worthy members of society. I love superhero stories exactly because of that: because powers are often double-edged swords that can cut both ways but we don’t see that conundrum enough. In this first book, it is Crash – whose power increases and changes and morphs more than anybody else’s that really undergoes that journey. I love that sense of moral and ethics is fuelled by her mother. It’s not for nothing that the subheading of the novel is “Every power has a price”. Now, doesn’t this sound awesome? Add to that the fact that the cast of characters is racially diverse (Nate is a super wealthy latino, we really don’t see that a lot in books) and that there is one cute romance that develops between two unexpected characters and you have the potential for GREATNESS. But for all of this, Zeroes is so just so very bland. There are sparks here and there: Anonymous’ narrative and very presence in the novel adds a level of unreliability because people have such a hard time remembering him and his story is by far the most emotionally engaging. The flashy side of Crash’s power increases the cool factor. But mostly, the narrative feels repetitive and overlong, going round in circles of sameness especially regarding the characters’ inner conflicts.